Should parents force their children to practice? Child music prodigies are usually the results of parenting. Research has shown that most prodigies have mothers who are disciplined and strict. Like Albert Einstein once said, "Genius is one percent inspiration and ninety-nine percent perspiration!" Here is an article by Frances Hubbard that looks at the life of two music prodigies. Every week day after school, Nathan grabs a quick supper and then completes two hours of demanding piano and violin practice, followed by at least another two hours of homework. Television and play dates are both outlawed during term-time; it is simply too difficult to fit them in. Nathan is ten-years-old. He is polite, articulate, accomplished and - by the time he goes to bed - very, very tired. His sister Natalie, aged seven, spends nearly two hours on her own piano and violin practice before her own homework begins. The children also attend a Chinese school on Sundays, to improve their Mandarin. Yes, admits their mother Vivian Tang, sometimes they complain or even cry - although she believes this is mostly out of frustration, when they can’t get something right. Vivian, 42, is a former beauty queen with an MBA from London Business School and the determined air of someone who knows that success takes effort. After a career in the City and as a business advisor, she now writes children’s books, when she is not looking after Nathan, Natalie and 20-month-old Aiden. HARD WORKERS: Nathan aged 10 and his sister Natalie, 7. 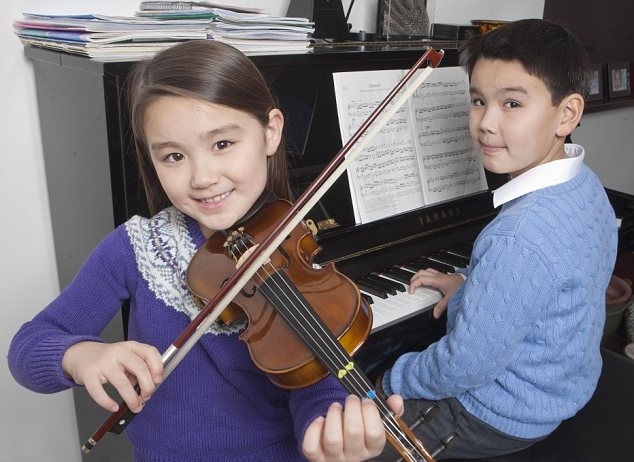 Nathan, it should be noted, is already tackling Grade 7 piano and Grade 5 violin, while Natalie is on Grades 3 and 2. Neither of them has ever said they want to stop music lessons, despite their occasional gripes about their no-slacking regime. They also consistently score excellent marks for academic subjects. Vivian belongs to that impressive and slightly fearsome breed, the ‘tiger mother’. Born to Taiwanese parents in Canada, she may live in north London, but her focus on making her children successful typifies a hard-headed Asian approach to education. If life is a race, tiger cubs are already in running spikes when the rest of the field is barely out of nappies. The term was coined by Chinese-American Law professor Amy Chua in her best-selling memoir, Battle Hymn of The Tiger Mother. In it, she recounts what happened when her iron-clad ambition to make her two daughters succeed clashed with her younger girl’s minor rebellion at the age of 13. Safe to say, however, Professor Chua emerged shaken but triumphant. Her oldest daughter has a place at Harvard University and has performed piano recitals in New York’s prestigious Carnegie Hall: her youngest may have slacked a tiny bit at music, but is now a champion tennis player. To give a flavour of her parenting style, here are a few of the conditions from Amy Chua’s list of rules. No grade lower than an A; nothing less than top of the class for any subject except gym and drama; no television; no computer games; no sleepovers; no play dates; no parts in school plays; no complaints about not being in school plays; no musical instrument except piano or violin; no choice of extra-curricular activities. Vivian covers her face and laughs when she describes her reaction to reading the book. Many British parents recoil from such strict parenting, and it is this gulf in expectations between many Asian and British parents that forms the basis of a new BBC documentary, Meet Britain’s Chinese Tiger Mums, to be aired this week. She believes that Western parents who favour a liberal, leave-those-kids-alone route may have something to learn from Tiger mother principles. In the most recent figures comparing the attainment levels of 15-year-olds from 65 countries, China comes out on top for reading, maths and science. South Korea is in second place. Finland, which led the table for a decade, has slipped to third and the United Kingdom hovers stubbornly around the mediocre middle, behind Poland and Estonia. British teenagers also score 16th for science, 25th for reading and 28th for Maths. Vivian’s American-Korean husband Alex grew up, like her, under strict rules to work hard and prove himself academically - so he shares her attitude towards parenting. Some couples, however, find it more difficult to agree on how hard to push their children. Kate and Michael Greener, who live in London, come from totally different backgrounds and have trouble reconciling their ideas about what is an appropriate level of homework for their daughter Juliette, 4. Kate, a building construction manager, is from Taiwan and came to England to study for the first of her two Masters degrees in 1998. Meanwhile, Michael, a Geordie, left school at 16 and never remembers being told that passing exams was important. He works as a residential caretaker for a block of flats. ‘We do disagree a lot,’ concedes Kate. ‘He thinks children should have a fun time and be allowed to do whatever they want, but I don’t think they can be just left to get on with it. I come from a country where there’s no safety net: if you don’t study, you don’t work, and if you don’t work, you don’t eat. Michael hasn’t experienced that kind of anxiety. ‘I definitely did more at Juliette’s age than she’s doing now. I started piano when I was three, and she’s only just begun violin: 15 minutes every night, with half an hour of English and half an hour of Mandarin. No television allowed from Monday to Thursday. ‘Juliette is rewarded when she does well, but she’s also punished if she gets things wrong. I think that’s a more accurate reflection of the grown-up world than constantly praising for the tiniest little achievement. Children who never hear anyone say, “No, do it again until it’s right” will find it difficult to cope as adults. How would Kate, 37, feel if it transpires that Juliette really wants to do to art school when she’s older? Nathan, Natalie and Juliette all attend the same Hua Hsia Chinese school near Hampstead, north London, on Sundays to improve their Mandarin. The school is the focus of the new BBC documentary. The difference between Asian and British parents is partly explained by what was expected of them in turn when they were children. Vivian and Kate had traditional Asian upbringings, and Kate remembers teachers routinely to strike pupils once on the hand for each question they got wrong. Their parents, too, cuffed them on the head or bottom for misdemeanours. Sally Chen is the mother of another Hua Hsia pupil, 7-year-old Matthew, and she endured a childhood that - even by Chinese standards - was extremely demanding. Her parents, both teachers, used to beat her if she disobeyed them or failed to gain top marks. As a girl in China, she was required to do an hour of English before starting school just after 7am in the morning, and three more hours at night - plus the obligatory music practice. Matthew’s timetable is almost lax by comparison. Pinned to the wall above the small table where he does his homework in their London home, it looks daunting but includes breaks for table football, television, shopping, playing in the park, basketball and watching his beloved Arsenal play once a week on satellite TV. From 7 until 9 on weekday evenings, he studies Kumon maths and English, Chinese reading and writing, English spelling and story reading. At the weekends, there is a further half hour of Kumon and piano lessons. Part of his routine is keeping a diary. ‘My mother does not have good maners (sic). She always shouts at me,’ reads one entry. Sally has carefully corrected the spelling to ‘manners’. ‘Matthew can be quite cheeky,’ she says. ‘But I wasn’t allowed to argue with my parents at all, so in a way it shows he is confident enough with us to answer back. ‘I had to say yes, yes to everything they said. Sometimes, if I wasn’t number one in class, I’d be scared to come home. ‘I worked so hard that I was two years ahead and got into a good university in Canton at 16, but the work was never something I enjoyed. I hated it. My parents never asked me what I wanted to do or gave me the chance to play. Sally, 43, came to Britain to work in hotel management but now works in a dental practice in London’s China Town. Her husband, Steve, is a softly-spoken chartered accountant. As it happens, Sally’s parents wanted her to be an accountant. So, like a good daughter, she studied accountancy for two years and then gave up because, in her words, she is ‘horrible’ at maths. Sally has tried to resist selecting a career for Matthew, but can’t quite suppress her maternal ambition. Steve takes a more laid-back view. ‘I think Matthew will be what he wants to be. It’s important for him to study because you need discipline and the ability to compete. ‘But you also need emotional intelligence to succeed in life. I’m really pleased he’s outgoing and confident,’ he says, stressing that he just wants his son to be happy.